Graham Edwards Trailers are able to offer every acceptable permutation to suit most commercial, industrial and agricultural flatbed trailer applications. By choosing a twin or Tri axle unit, with195/55 10 wheels and tyres,you are purchasing the UK’s lowest deck height trailer commercially manufactured. The above pricing represents just a fraction of our flatbed trailer production. If you don't see what you require, please ask. 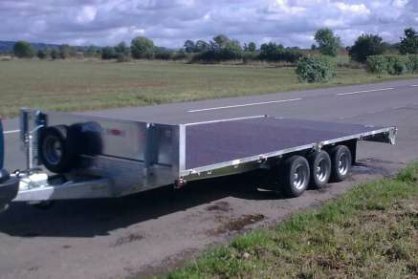 We can produce flat bed trailers from tiny 6' by 4' models to massive 23' by 8' to special order.